Thank you to everyone who stopped by the Sweeties New York Pastry Co. table at the Greenpoint Food Market today — it was wonderful to see so many new as well as familiar faces. 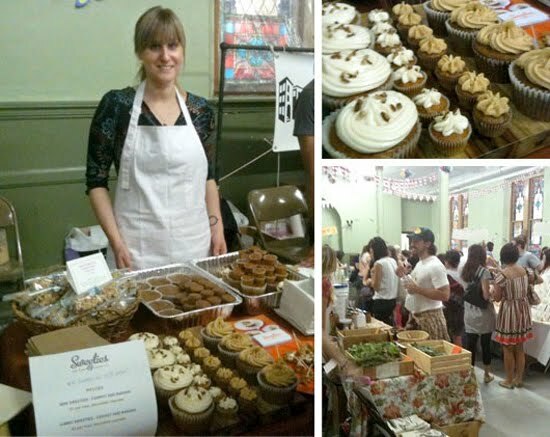 Pictured above from left to right you can see moi after we first arrived, getting things together and steering the Sweeties ship; a sampling of some of the final Sweeties cupcakes in both flavors and sizes (the ones on the left are Carrot and the ones on the right are Banana); and a shot of the busy Greenpoint Food Market, bustling with food lovers from all parts of Brooklyn and beyond. We definitely had a great day and I look forward to more in the future!